All you really need to kick start a Royal Enfield motorcycle is gas, a well-tuned Royal Enfield and the proper technique. At least, that is what people will tell you. You also need confidence, the self-assurance to give a full, fast kick without holding back for fear of a violent backfire. Courage! Without self confidence you might hold back just that little bit and fail to start the motor. Royal Enfield riders have noticed that this tends to happen when other people are watching. The motorcycle seems to want to keep you humble. Last night I was reminded that motorcycles aren't the only friends in the world who help us stay modest. By this I refer to our wives and girl friends. "You got a great response to your blog items about kick starting," my wife commented, as we took our nightly stroll. "You seem to have struck a real chord with your readers." "Is it hard to kick start a motorcycle?" she asked. Innocently. "No," I replied. "Only when you're trying to impress someone." "Is kick starting a motorcycle supposed to be impressive?" I must have grunted something, because we changed the subject. But you can see her chain of thought, can't you? Kick starting a motorcycle can't be that hard: even my husband can do it! So, yes, dear. You are supposed to be impressed. Kick starting a motorcycle doesn't require much strength, but it does require manly confidence and courage. Why? Because if this thing isn't in tune it can throw my boot off the starter and back into my other shin so painfully I may roll on the ground in agony, cursing. This has happened (luckily no one saw me). When I kick start the motorcycle I am taking a real chance — of embarrassment. Your role, as audience, is to be very, very impressed. 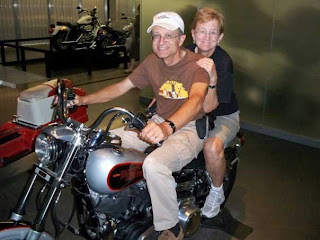 Bonnie and I pose a stationary motorcycle at the Harley-Davidson Museum in Milwaukee, Wis.
Any monkey can push a button. Kick starting is cool because it's a primitive and dramatic way of physically cranking the engine to life. You're coming in direct contact with the gears. Your motion is the revolution that is the catalyst for producing the spark. It's the old way... from a time when men were men. Kick start Enfields don't require a lot of muscle, but if you learn the technique, and you get the engine to rumble to life, it's very satisfying. What is the proper starting procedure for a Royal Enfield? Or is it different for every bike? Let the record show: Bonnie is indeed impressed. lol .... waiting for my future c5 i got a Yahama srx 600 1987 KICK STARTER ONLY. I wouldn't have bought it if it was electrical starter. The first few times I used it ( especially the very first one ) I got stuck somewhere in the middle of nowhere here in Ireland for at least one hour and I was sweeting to kick her to life as if I was running 10 miles with the rain gear on. She didn't want to start when she was hot :-) , and I was actually scared of tacking her for a ride. Beside that with no apparent reason the engine sometimes was getting to 4000 rpm on his own !!!! sometimes 5000 . Then, relying on my former mechanical skills I decided to give a look at the carburetor. She starts first kick cold and warm now. And I'm not sweating any more. I think I'll keep her even when I'll get the Royal. just to compensate the electrical stuff on the Royal you know.. Skip: Here's how you start an Enfield. If it doesn't start, repeat 7 and 8.